'In-between' was an exhibition outcome of a one month artist residency series undertaken by Robbie Rowlands in the country town of Charlton Victoria in September 2014. Artist Robbie Rowlands captures the essence of two sites united by one river through sculpture, photography and sound. Through a series of artist talks and the creation of site-specific artworks Rowlands introduced his practice to a broad section of the community. This engagement opened up new ways of considering contemporary art within the context of the rural landscape and country communities. 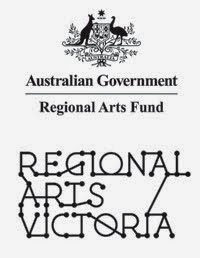 The project was co supported by Regional Arts Victoria and Charlton Arts Inc. Thanks to Andy and Paula Wright, Charlton Men's Shed, Nola Wright, Carolyn Olive & Family, collaborative project participants, the Charlton community, Kim Bennett and Regional arts Victoria . Created as a collaborative and final work for the residency series with Andy Wright. Soundtrack created for In-between Exhibition. Found car leaf springs played at Wright farm shed site.